"But you said we were done with the SKX diver's. You liar!" Relax! 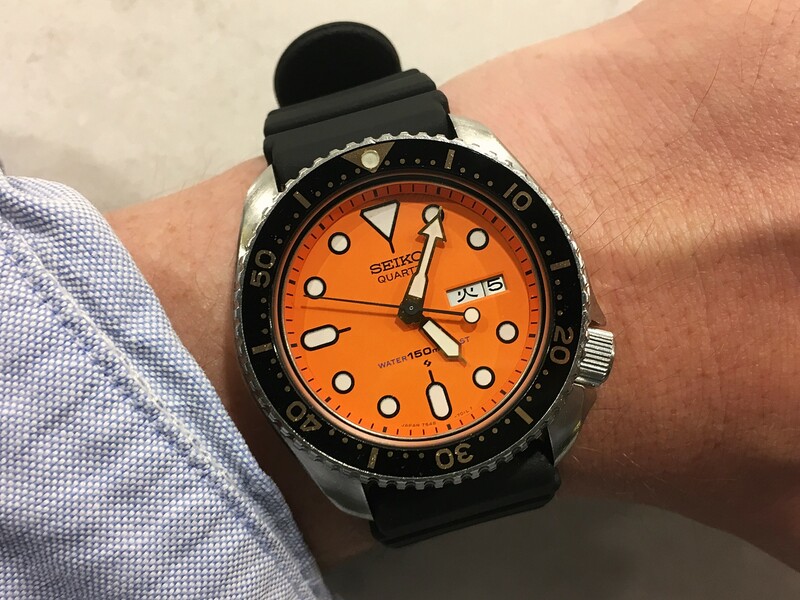 If you thought this was a boring SKX you better look twice. 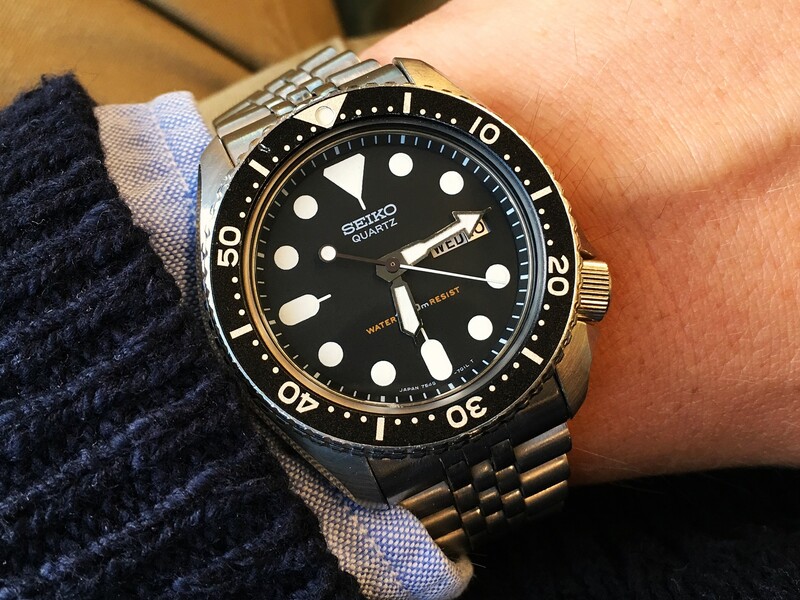 This is not your regular automatic SKX even though at a quick look glance it might appear so. No, instead I present to you one of Seiko’s best watches of all time - The Seiko 7548 quartz diver! A true toolwatch. You're welcome. The 7548's are fantastic (even though I actually do prefer its successor, the 7C43) and they were made during my favorite era; the early 80’s. This was a time when all the coolest toys were made (G.I.JOE), the best heavy metal albums were recorded (Defenders of the Faith by Judas Priest) and also the time when my parents decided that I was going to be produced (1984. Which also happens to be an incredible album by Van Halen). Hunting Seiko’s from my birth year is great and something I can always go back doing when I have no other watches to chase. The first one I got hold of was actually from 1984. From January I think. And that was actually kind of cool because I got it in January 2014; exactly thirty years later it was made. Got it head only and located an original Seiko president bracelet for it. A perfect match! Too bad I wasn’t born I January. That definitely would have made it a keeper! #207 - The Seiko 7548-7000. This one was made in January 1984. On an original Seiko president bracelet. The second one I found had a beautiful patina and the resist dial. It directly ended up at my friend Björn’s because it was from ’83; his birth year. He later discovered that instead of a Seiko movement it housed one from Pulsar. Apparently it is supposed to be the same but with a different name on it. #212 - Seen to the left next to watch my first. A 7548-7000 from September 1983. My third was from 1981 which I found on WUS. It had a blue dial (which doesn’t look blue in the pictures) and the hands and indexes had a nice eggshell tone to them. It was pretty worn already and I made an attempt of trying to bleach the already perfectly faded original insert a little more. Stupid! It almost lost all of its color. #237 - The third one. A 7548-700F from June 1981. Before the insert was bleached. Number four was from 1983 and was the one I gave the most love and wrist time. It had an aftermarket bezel insert and was already re-lumed when I got it. But it was more like paint that had been applied than new lume. In other words a perfect specimen for a modification. It was initially bought to be used in the making of a 6309-7548 hybrid (more about that project later). The insert was given a slight fade and Magnus helped me out by removing the old lume and applying new modern blue lume for both the handset and the dial before all the parts were put into a 7040-case. But after I grew tired of the hybrid I decided to have the parts back in its original case. The crown, battery and all the gaskets were replaced by a watchmaker before I brought it with me for a one month vacation in southern France in July 2015. It served me really well and actually got to go with my on my first scuba dive ever. I remember staring at the watch just as much as the surroundings. Magnus waiting for the lume to dry before adding another layer. Bottom left: watch #242 - The 6309-7040 that was used to create the hybrid. #245 - A re-lumed and serviced 7548-700B from 1983. Worn on a Bonetto Cinturini 284 rubber. I think it was beautiful! The lume pip came off while bleaching the insert. Post dive picture. Just outside the coast of Cap Ferrat, France, July 2015. This watch got to go below the surface for more than just a couple of meters in a swimming pool. Exactly what it was designed for. Being on vacation didn't mean that I could lay off the watches and one evening, sitting on our balcony with a Gin and Tonic in one hand and the iPad in the other, I found my fifth one. It was another one from 1984 and had a perfect dial and a lovely worn bezel insert. It had recently been serviced and was delivered on a loose jubilee bracelet. This one was really nice but I actually sold this one before I parted with number four which was the one that got to stay the longest. #260 - Another 7548-7000. My fifth and final 7548. This one was made in December 1984 and was in a superb condition. The 7548’s are really heavy duty watches and it’s like I can never get enough. But as I mentioned in the beginning, I do prefer the 7C43’s and that’s just because they are even more heavy duty with the 200m rating and the high torque movement. Those watches will last you a life time and can withstand almost anything you throw at them. I must try to keep myself from not buying any more 7548’s because I hate going back and update my old posts. I should consider every post as the mark of a finished chapter in my watch flipping history. It’s better to look around for new interesting watches to write about. Damn… I just realized that if I chose to follow that rule I should try to find a couple of 7C43’s really quick while I'm allowed before I put an end to that chapter to. Off to work! UPDATE - August 16th 2016. This is just too crazy. The day after I wrote the things above (about how I should consider a post about a watch as a closed chapter and not buy that model again) I just happened to run into the finest example of a 7548-7000 that I had ever seen. A pure accident. I wasn't searching for one. It just came to me. What should I have done? Just ignore it? That would have been stupid. Instead I embraced it. #312 - The sixth 7548. From February 1982. All original in super condition! Not flawless but not far from it. Wrist shot with a jubilee bracelet from a SKX-diver. 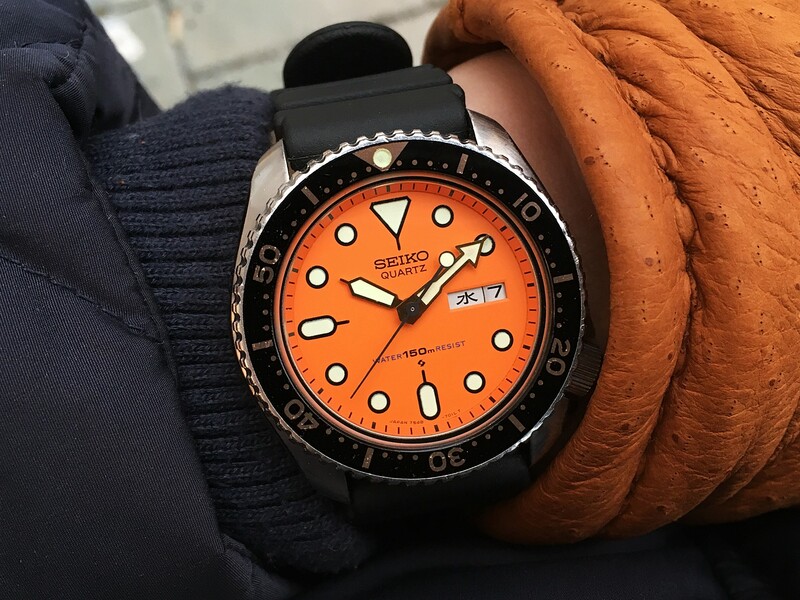 Wrist shot with an original Seiko DAL1BP rubber. UPDATE - January 15th 2017. Here's a little update with two new references of the 7548 that I haven't had before. The first ones out are two 7548-7010's; the transitional model before it was replaced with the 7C43. The 7010-version was constructed like the 7C43 with the screw down crystal and therefore has the 200m rating but it still has the 7548-movement. I managed to own these two watches at the same time and both were manufactured in 1984. I found the first one for sale at SCWF and a watch friend managed to source the second one for me from an online auction in Japan and it turned out to be in an amazing condition. The really cool thing about this particular reference is that Brian May from Queen wore the same watch for many years and it can be seen in several pictures of him. That cool fact made me love this version even more. I actually intended to keep the second one but I was approached by someone who really wanted it and I eventually decided to part with it. #319 - My first 7548-7010, a so called "transitional". Sold it because the second one I got was much better. #320 - My second 7548-7010. Fantastic condition! From October 1984. Out for a little pike fishing. Navigating through shallow treacherous water and taking pictures of the watch at the same time can be a little risky! Out for a walk in the harbor on a sunny Sunday afternoon in October 2016. The latest 7548 I've had was the 700C which is the orange dialed JDM version. I was lucky this time again a found an incredible well preserved specimen with a flawless dial. To my great horror this one disappeared for a really long while in the mail. Its last scan was when it took off from Copenhagen and it should have arrived in Stockholm the next day if everything had been right. I tracked it every day for several weeks but nothing. I had actually given up hope of ever receiving it but then one day it had showed up at the post office. I rushed down to my local delivery point, handed them the tracking ID, and was asked to show them my ID. "But sir, your name isn't Indiana Whiting" the cashier said "We can't hand out this parcel for you". I was of course confused but told him to just go and get the package so that we at least could take a look at it together. "Sorry sir, I'm afraid I can't do that". At last I managed to convince him to go and look at it without me to see if he could find my name anywhere and when he eventually returned with it he was laughing. It turned out the parcel had been sent from Whiting, Indiana, in the United States, and somewhere along the way a faulty registration had taken place where Mr. Indiana Whiting had become the new receiver. My name and address could clearly be seen on the package and I was allowed to leave with it. This one was really cool but short lived in my possession and quickly flipped. Taken just seconds after I received it. I always keep a few spare DAL1BP rubbers. They always come in handy!